“Hey Steelers fans – does our new little addition remind you of anyone? Say hello to Baby Ben! We know which team he’ll be rooting for on Sundays.” — Vale Wood Farms, in Loretta PA this morning. Carissa Itle-Westrick, the director of business development for the family-owned food-and-grocery farm, is hoping his daddy won’t mind either. Vale Wood Farms plans to show off their little calf next month when Autumn is in full swing and Halloween is just around the corner for their Pumpkin Patch event. 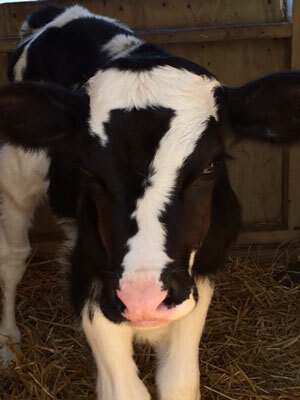 “Baby Ben will be featured at our Pumpkin Patch, October 1-19, so folks can come out to see our littlest #7”, said Carissa. If you’d like to know more about the Farm, and their upcoming events, just go to their Facebook page and they’ll be happy to answer all of your questions! *And don’t forget to say hello to Baby Ben while you’re there (who is probably gonna milk this new-found fame for all it’s worth! ).